This is a tropical delight. Bright fruity bouquet reminiscent scent of fresh cut peaches with refreshing green tones, creating a balanced fragrance that is just to good to be true. With our Peaches & Cream Odor Eliminator Air Freshener Spray, you will be ready for summertime fun. This odor eliminating air freshener will whisk you and your worries away with a true-to-its-name fragrance and smells just like Peaches & Cream frosty. —order your Peaches & Cream Odor Eliminator Air Freshener Spray from our online store today! Smells Like: Refreshing scent of mouth-watering Peaches & Cream frosty. Struggling with lingering cooking smells, pet odors, smoke, or any stinky smell at home/office/car? Looking for a solution to eliminate the unwanted odor without masking it with chemicals? Get Wicked Sense Odor Eliminator Air Fresheners. Our air fresheners give you the soothing experience, yet eliminates any household odor, smoke, and even pet scents at a fraction of the cost of everything else out there. 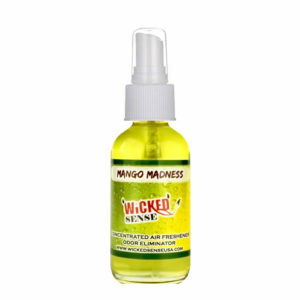 All of our Wicked Sense products are infused with our special Odor Eliminator ingredient that destroys any odors from its sources in the air and make your home/office/car/any-space uniquely appealing for all. Keep out of reach of children and pets. Do not apply directly to the skin. Avoid contact with eyes. Oils can stain fabrics, wood, plastic, and painted surfaces, and leave residue on hard surfaces. May cause surfaces slippery. Not for consumption. USE WITH CAUTION. © 2019 Wicked Sense USA.